Sure you could go and get the same OPI as everyone else on the block, but did you know that there exists so much more to the nail polish world beyond the Sephora nail bar? 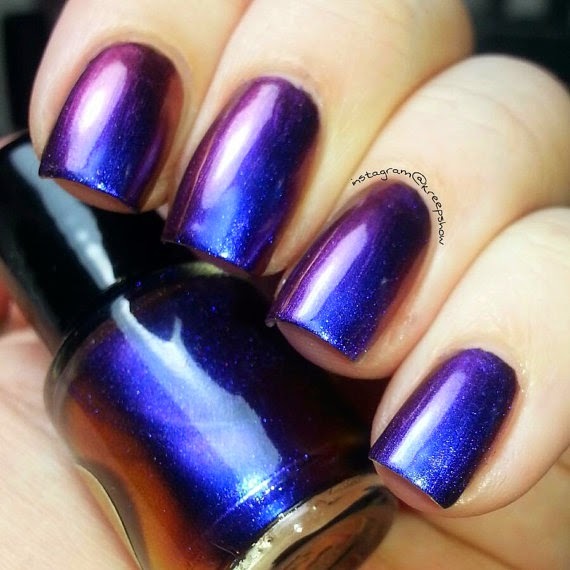 I didn't, but I was fortunate to get a peek through the magic curtain recently when the girls of the CBB got together to do a custom nail polish order with independent nail polish designer, Tanya of IndiePolish. As part of designing our custom polishes, we got to choose the base, the type, and any other extras in-between - and all for only $10 a bottle! That might seem a bit steep at first, but considering a Butter London or a Deborah Lippman will set you back a similar price, I'd rather go custom any day. Being a Libra, it was a humungous task for me to decide, but I knew I absolutely wanted a milky base. After seeing some gorgeous milky polishes on Pinterest, I was inspired to create this fun, uber girly mix that I christened "Jojo loves Ecko." Ecko of course is my dog and the name was actually meant as a placeholder until I thought of something more clever. Besides the milky base, this polish contains sparkly pink stars, iridescent turquoise octagons and pink and purple glitter throughout. It was a little tricky to apply this polish as the stars sunk to the bottom and as with most glitters, you kinda have to dab it on to get a good distribution of glitter. This one applied better than other glitters I've had as the polish wasn't super gloopy and I was able to get a decent finish in two coats. Although I loved the look (especially in the light! ), the downside of this polish was the wear time. Within 3 days, it was literally flaking off in huge chunks in the shower and sadly, I had to take the whole thing off. I think perhaps next time I'll just put on a base color and then pour some of this polish out in order to apply the stars and glitter more easily. Tanya of IndiePolish was super easy-going to work with and seems like a really friendly person. I highly recommend buying from her because 1) always gotta support the independents! 2) her polishes are vegan, 5 free and she has a really cute origin story for her store and 3) her stock polishes are AMAZING! 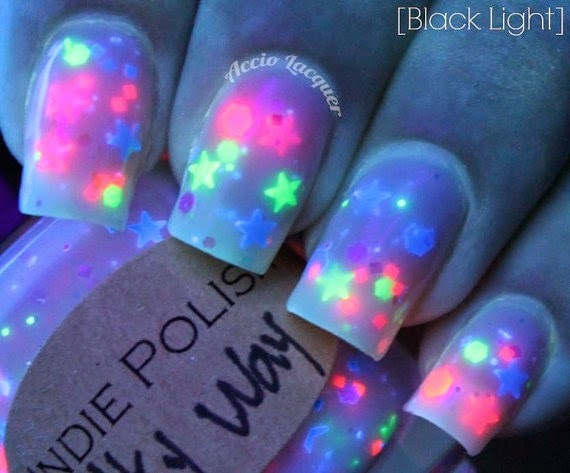 Milky way neon stars, $9.75 - I adore this cool milky jelly, especially with the neat black light finish! 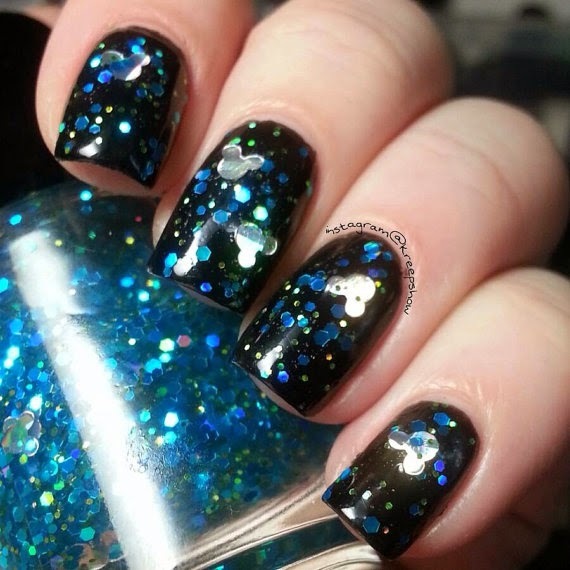 Typhoon lagoon, $9.75 - the only time I've felt the urge to buy black polish was after looking at this blue glitter topcoat. So galactic! Spring by Monet, $9.75 - a beautiful clear polish with blue, yellow and pink pastel glitter. Add a fun finish to any color!